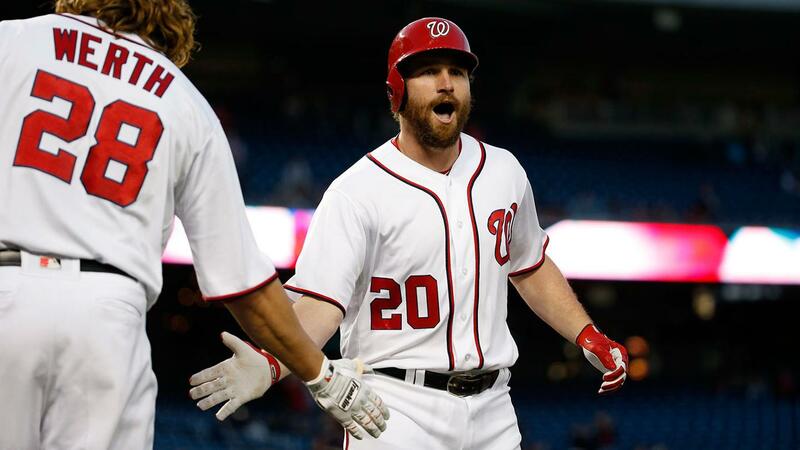 Wilson Ramos collected four hits and Daniel Murphy continued his hot start to the season as the Nationals defeated the Braves, 6-4, Monday night at Nationals Park. This was the first game of a seven-game stretch against the rebuilding Braves and Phillies for the Nationals, a schedule that gives them the opportunity to get off to a fast start to the season. They overcame a rocky outing from Max Scherzer, whom the Braves were on from the start, beginning with a two-run double from A.J. Pierzynski in the first. Scherzer battled through six innings, surrendering four runs on six hits with three walks and six strikeouts. The Nationals answered the Braves' two-run first with three runs in the bottom of the inning, punctuated by a two-run homer by Murphy off Braves starter Bud Norris. Norris pitched well against the Nationals last week in Atlanta, when he gave up three runs in seven innings, but he did not have the same success Monday. He surrendered five runs on nine hits and issued a pair of walks through five innings. "There were a lot of groundball singles," said Norris, who threw 37 pitches in the first inning. "I'm trying to keep the ball in the ballpark. It's tough to face the same team in back-to-back starts. Every starting pitcher will say that. I tried to battle and give it everything I had." Big day for Ramos: Ramos entered the game hitless in his last nine at-bats before going 4-for-4 at the plate and driving in a pair of runs. It was the third four-hit game of his career and first since 2013. His presence was also felt behind the plate, when he threw out speedy Braves rookie Mallex Smith in the fourth inning. It's the second consecutive day Ramos has thrown out a speedy baserunner, after catching Marlins second baseman Dee Gordonstealing Sunday afternoon. Double trouble: After Pierzynski gave the Braves an early lead with his two-run double in the first, Nick Markakis softened the blow of Washington's three-run first with the two-out, two-run double he delivered in the second inning. Markakis began the fifth inning with his fifth double within a span of nine at-bats. But he was left stranded at third as Scherzer retiredFreddie Freeman, Adonis Garcia and Pierzynski without the ball leaving the infield. The Braves recorded just two hits over the final four innings. Murphy settles in with new team: There was no adjustment period needed for Murphy, who is now 8-for-17 with two homers through his first five games in Washington after a pair of hits Monday. It is as if he picked up where he left off last October, when he helped carry the Mets to the World Series. Braves: Jhoulys Chacin will make his season debut when Atlanta and Washington resume this four-game series on Tuesday at 7:05 p.m. ET. Chacin earned a rotation spot during Spring Training, but to fit their roster needs the Braves had the veteran right-hander make his first start of the year with Triple-A Gwinnett. Nationals: Gio Gonzalez will make his season debut as the Nationals host the Braves for the second of this four-game series at Nationals Park. It will be Gonzalez's first outing since a Spring Training game on March 27 after beginning the season in the bullpen because the Nationals wanted to slot him in between Max Scherzer and Stephen Strasburg in the rotation.